It’s all about vintage styling in this ‘secret’ (but clearly signposted from outside) venue above the Coach & Horses pub in Soho. 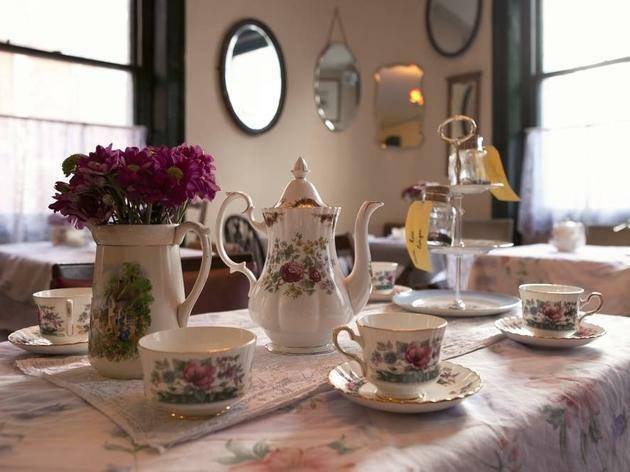 Decked out like a retro tearoom and complete with fine bone china and a crackling soundtrack via a gramophone, the venue is serene retreat from the Soho bustle below. There are 16 loose leaf teas on offer, alongside sandwiches, scones, cupcakes, fairy cakes and a wealth of sponges - all of which are made by the Soho's Secret Tea Room team. You can add a glass or two of Champagne to your cream tea, should you want to make things a little more interesting. A lovely but basic afternoon tea experience. Very cheap but needs updating. This was the first place I had an afternoon tea at in London - and it was a good starting point. I loved that it was "secret" and so was very excited when a friend I was visiting suggested we go there for the traditional experience. We showed up at the pub downstairs and mentioned our booking to the barman, who rang upstairs to confirm. Unfortunately, there was some kind of a miscommunication and we ended up having to wait 45 minutes past our original booking time to go on up, which was really annoying but we had been too looking forward to it and it was my last night in London, so... we waited. Eventually, we made our way upstairs and were seated. Orders were taken, and I marvelled at the curated room. It was just like I imagined afternoon tea to be! (These days not so much as I've a penchant for more fancy-type ones, but hey I wasn't complaining!) The food was lovely, the tea was hot and plentiful - I spilled it on myself but hey, that's very me - and the ambiance was great. I haven't been back since then but as that was 3 years ago, I'd be happy to give it another go-round! Although vegetarian myself I never had an eye for veggie/vegan places in London, but as a friend of mine prepared to leave London she asked me to join her for a Sunday roast. I have to admit that when we first entered the pub appeared to be the average watering hole and being located in Soho a change from the touristy places. We thought about sitting down in the pub, but decided to eat in the dining room - which was (I have to admit) a huge surprise. The dining room is a beautifully decorated vintage tea room (you would never guess that such a gem is sitting above the pub). Unfortunately they didn't receive our booking (it's recommended to call instead of sending an email!!) the waitress managed to squeeze us in. Although I was tempted to go with the vegetarian roast (nothing can beat a Yorkshire pudding) I decided to try the vegan version. I have attached a picture of it (it would have come with potatoes, but they are not my favourite) - at first it seemed a little expensive, but halfway through we both realised that the portion is going to fill us for the day. The food was excellent and the service great (even when the room started filling up). I wouldn't have known that such a place is hidden in busy soho. Apart from Sunday roast (and vegetarian options for most of the common pub foods) they offer an afternoon tea as well. I have already booked a table to try the tea and will update the post as soon as I have tried it. I'd really recommend the place for every vegetarian/vegan who misses traditional English pub food or is looking for a dining experience, which lets you forget that you are currently sitting in the buzzing city centre. My sister and I found this little gem a few years ago and apart from going in ourselves, have introduced it to several of our friends. The staff are generally friendly and attentive, some dress in authentic 50's wear to fit in with the feeling of the place. You will be hard pressed to find a cup, saucer or plate that matches which is quite quaint and you always stand a chance of sitting next to someone famous, Jarvis Cocker in my case. Two drawbacks of late tho...the old embroidered tableclothes have been replaced by paper ones and the lovely old record player has been replaced by a CD player, both these changes have spoilt the 'period' feel of the place, although I'm assured by staff that both are temporary. APPALLING Horrendous service, dirty tea set, surly slow staff. Escaped before they took our order as we were waiting for 20 mins for them to do so. Looking at other peoples food we were also less than impressed. The entire place was filthy. Pretty miffed that we only went because we saw the (positive) review on timeout. Dreadful from the dingy pub entrance we climbed up filthy stairs to be seated at a table with a very dirty tablecloth. We made our excuses and left pronto, feeling we'd had a lucky escape! I have been to a lot of tearooms but this is my favorite. The food was great and the service was fantastic. The desserts were awesome! Thanks for making our trip to London so special and memorable. Lovely room but that's about it. It's a real shame because it could be a really fantastic place. oh and the service - Appalling!!! I thought it would be nice to take my mum for her birthday but we did not enjoy our afternoon tea experience here. First of all you have to go into a dingy pub (Coach & Horses), and ask the bar staff what to do. They then let you in behind the bar and up some narrow stairs, (not the greatest first impression) which leads to the tea room. 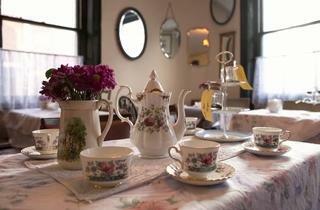 When you get up to the tea room it's quite a pleasant surprise with it's quaint old English decor. But then on closer inspection we had wrinkled tablecloths that were also stained quite badly, and cracked tea cups. I actually felt quite embarrassed that I had brought my mother there. The staff were friendly though and dressed to impress in old fashioned attire. We had the full afternoon tea priced £17.50. The sandwiches were very basic, plain cucumber, egg & cress, or smoked salmon & cream cheese, on bog standard bread. The scones with clotted cream and jam were delicious. The fairy cakes were very boring and dry and seemed like they were out of a packet. The other cakes left A LOT to be desired. They had a good selection of teas but you had to pay extra for anything that wasn't English Breakfast. 12.5% service is added to the bill. All in all I would not go back here again. I didn't think it was worth the money and it wasn't special enough for a birthday, I wish I had paid a little more and gone to a hotel. Loved this place! Great fruit scones, generous with the clotted cream and homemade jam, attentive service and a really cosy comfortable feel. An hour in here feels like a welcome escape from the madness of central London. Good value too. Make sure you book your afternoon tea at least one month in advance because they check emails every two days. very disappointed because I was trying to have a vegan afternoon tea with my family coming from Italy but I never got a final reply to confirm the booking and when I got there they could only serve me "vegan bread" as a vegan option. Thanks but I can find vegan bread anywhere and much cheaper than 17.50! Me and my sister visited the Secret Tearoom on the off chance as we saw it being advertised on a French TV, and were visiting London. We hadn’t booked but they still gave us a table for 2 by the window. We had a Cream Tea each, which were scones with cream and Jam and a pot of tea. The staffs were very nice about fitting us in and the food was delicious. It was even nicer then the TV show had advertised. We didn’t stay long as we had things to do but very happy we had the chance to pop on and take some photos to show everyone back in France. Wonderful tea room. For me the best in London and visit couple of times a month when in Soho. Their homemade cakes and scones are fabulous and the staff are really cool. Absolute nonsense about beer smells wafting up from downstairs!! As with serving burnt scones I have never had a problem. Love it!! Great place! I come hear on and off for the last year. Never had a problem. Love the tea, the style, the staff and the cakes. Scones are home made and and for me spot on. As for smell of beer that is nonsense! Nice place, except the smell of beer wafting up from below was a bit off-putting. The quality of the food, though, was poor. My scone was not only rock hard (inedible) but also actually burnt black on one side - any decent place would have thrown that one away, not served it. The blackcurrant jam was too sour. The rest was just about OK but not one item of the full tea was actually what I'd call good. Service was pleasant, though. Probably won't bother going back. Had a terrible experience with them, we booked a private party with them and two weeks before (just before Christmas) they pull out because they got a better offer of a larger party! The place looks great, but I can't believe a company would be so unprofessional. I'm really surprised by the bad reviews. This place has a sense of fun about it and the afternoon tea is a steal for £14.50 in central London (even more so if, like us, the charming staff let you share a standard afternoon tea between two). We went as a group of six, as an alternative hen do, and were brilliantly well looked after. Sometimes old school is good and we liked the no-frills (but tasty) sandwiches, and the cakes, which included a decent lemon drizzle cake. If you want fancy bread, fussy fillings or biscuits shaped like handbags there are plenty of other places that can offer those in London... usually at an extortionate price. Our main worry was that the retro thing would be a bit twee but it wasn't, just a tongue-in-cheek nod in that direction. All in all it was fab. My friend I went to the tearoom today with some trepidations after reading a couple of rather negative reviews. Well, we loved it! The room was like a step back in time. The waitress was lovely and we thought it was great value for money. We chose the afternoon tea which comprised a pot of tea each, a selection of sandwiches (smoked salmon with cream cheese, cucumber and egg and cress) with the crusts off. A delicious, light, warm fruit scone with a little pots of clotted cream and jam, a slice of cake (choice was fruit, Victoria sandwich, chocolate or carrot) and a cup cake (lemon, vanilla or chocolate). Whilst maybe not a traditional afternoon tea cake selection the cakes were nice and fresh. A very pleasant few hours to chat and relax whilst the hustle and bustle of London continued outside. Well worth £14.50 each plus service. I went to the tearoom with my mum the other weekend as she was visiting London and loved it. Everything was so vintage and sweet and i thought the selection of cakes were great. My mum said it was like walking back in time, we had a lovely chat with one of the staff members too about the history of the place and we thought she was very friendly. Really awful, seemingly the people running it care little for food but rather focus totally on retro appeal. The sandwiches were appalling and made out of bog standard plastic bread, the small slice of cake which cost £3.50 tasted solely of almond essence, the cupcakes looked like a four year old had made them and who eats cupcakes as part of a proper afternoon tea anyway? Bad times. Reluctant one star for what is the worst scone either of us had ever eaten. So many things wrong here - cake in the fridge going soggy, stale premade crustless sandwiches, school bake sale cupcakes. Only plus points were a decent cup of tea oand a lovely room - the effect slightly marred by inept service though.